The Unlisted 10 Bar Queensland Railway Numerals. What's a 10 bar Queensland Railway Numeral I hear you say! 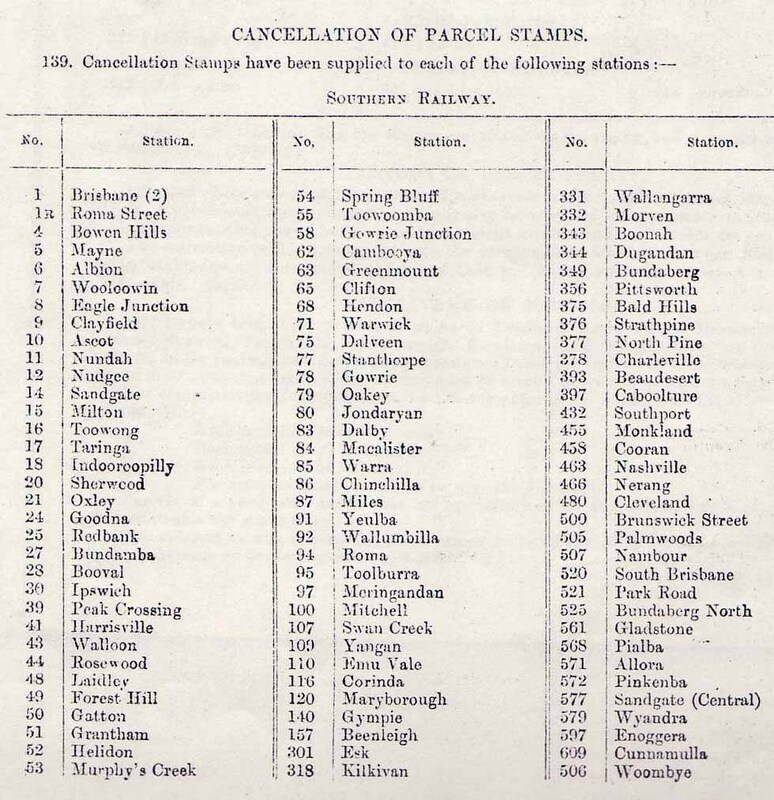 Each post office in Queensland was issued a number and a numeral canceller to cancel the stamps with. These had 9 bars, the railway was issued with numeral cancellers similar to the post office but these had 10 bars. 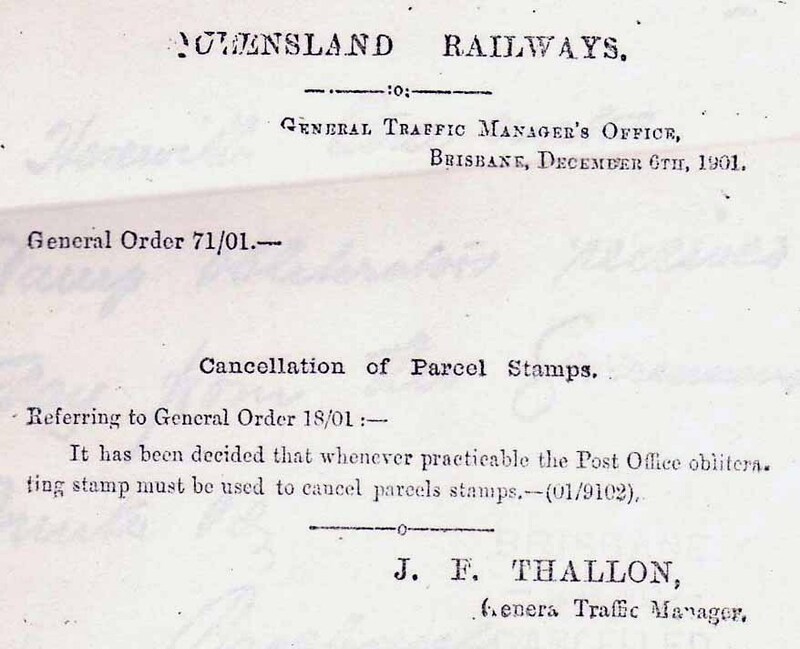 All postage stamps were supposed to have been cancelled with the 9 bar and the 10 bar was for cancelling the railway parcel stamps, as the two were so similar confusion reined and they were easily mixed up. Maker of the Railway Cancellers is unknown. 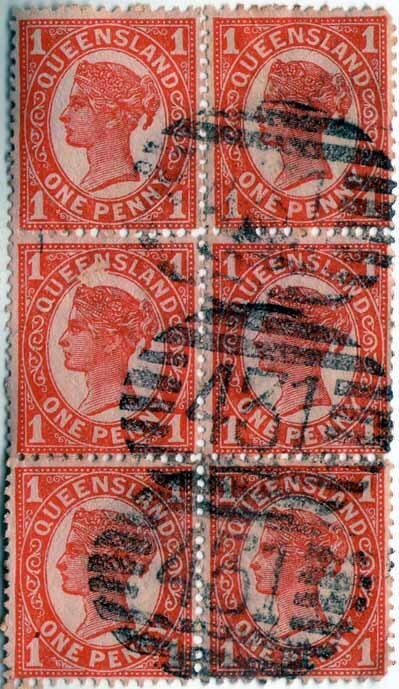 "Queensland Postal History" 1990 H. M. Campbell. 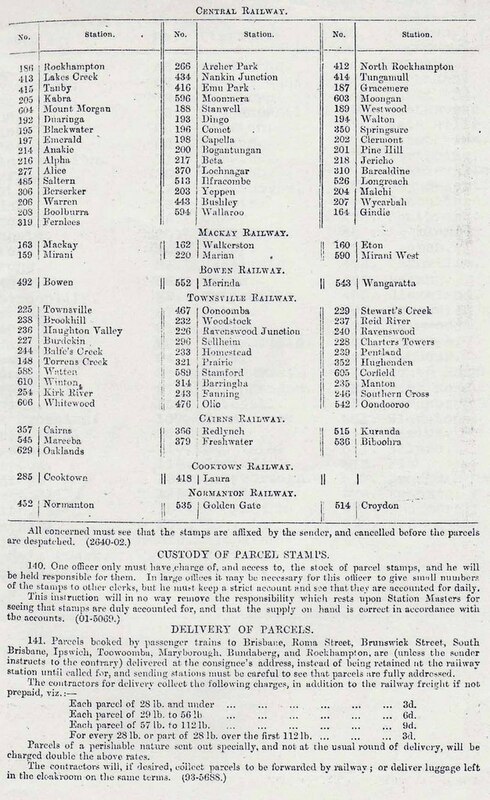 Mr. Campbell writes: On 6 January 1902 100 x 10 bar numeral cancellers were to be supplied to certain railway stations. These 100 stations are listed at the bottom of this page. 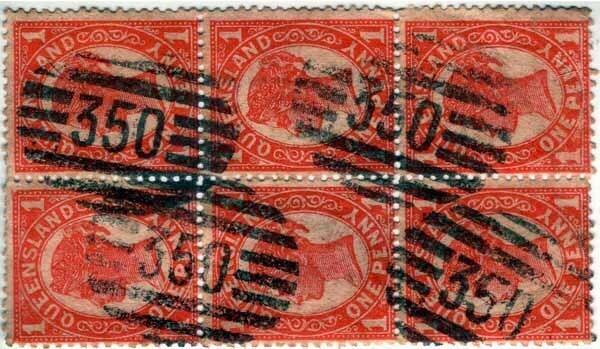 It is the additional unlisted 97 x 10 bar numerals that were issued on 6 January 1902 and further additions that I am addressing here. Listed below are 10 bar numeral cancels that are not on Campbell's published list of 100. Also listed with them are additional numerals which are not on the 1902 list of 197. 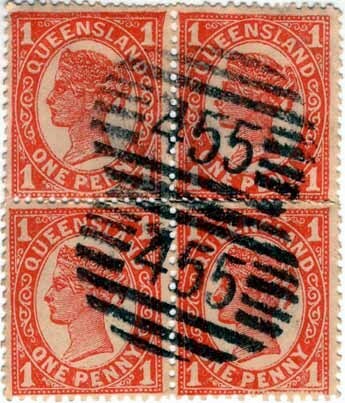 All are on Queensland State stamps except three, which are found on the one penny kangaroo, and two which are tied to TPO cancels. Battle ground. Another dialect "back of neck"
Blue = Dave Elsmore [Queensland Australia] Collection. Red added 22 April 2007 = David Hopper [Canada] Collection. Green added 23 April 2007 = Carl Burnett [USA] Collection. Below are the 100 x 10 bar numerals originally listed by Campbell and sent to stations 6 January 1902. The only problem is there were 197 numerals to list as the second graphic shows. Cairns Railway, Cooktown Railway and Normanton Railway [below]. Below is of interest as it confirms official notice that the post office canceller was to be used to cancel parcel stamps.